The Archbishop of Canterbury has changed the long-established convention that spouses are invited to Lambeth Conferences and contradicted the blanket statement he made in a recent video when he affirmed “of course, bishops’ spouses will be invited as well as bishops”. 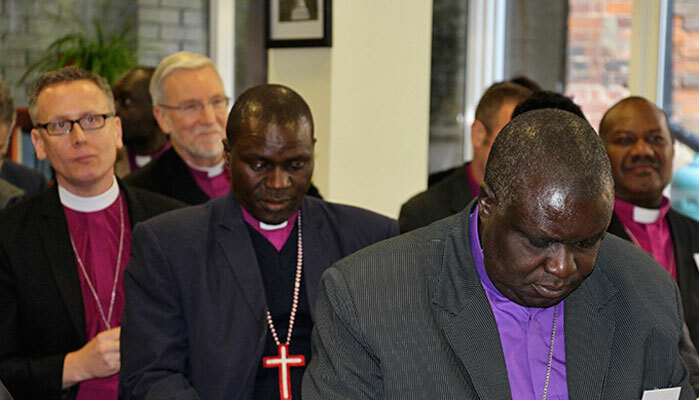 – The latest from GAFCON on the latest Lambeth confusion. On the latest Anglican Unscripted, Kevin Kallsen speaks with Dr. Stephen Noll about Lambeth 2020 and the current state of play. “The faithful bishops who attend Lambeth will probably be shepherded by Anglican Communion Office ‘minders’ to various huddles and gatherings apart from their fellow Biblically faithful bishops. In past conferences, their comments have been mysteriously omitted from official reports leaving no opportunity for dissent. They were also shepherded to a ‘photo-op’ with the Archbishop of Canterbury and the other bishops. If you are a Biblically faithful bishop present at Lambeth 2020, your smiling presence in the conference photograph will be taken as your unconditional public approval of what is expected to be the reversal of Resolution 1.10 (1998), the Biblical standard among Anglicans on the clarity and authority of the Bible as it speaks to matters of human sexuality, marriage, Holy Orders and leadership standards within the Church. Does anyone want to hazard a guess who that ‘significant Province’ is and the support they may be threatening to withdraw if things don’t go their way? – You really ought to take the time read the full post (and last week’s) by Canon Phil Ashey of The American Anglican Council. “A congregation in the north-east Scottish coastal city of Aberdeen is preparing to leave the Scottish Episcopal Church. Members of Westhill Community Church voted last night (Thursday) by 83 per cent to 13 per cent to leave the Anglican Communion’s province in Scotland following what they say is the ‘continued liberal trajectory’ of the Church. “The result of the vote on Thursday 17th January asking whether you agree with the leaders and vestry that Westhill Community Church should leave the Scottish Episcopal Church was 87% Yes and 13% No, with 2 spoiled papers.